Public spaces all over the country are currently being occupied by a new generation seeking a sovereignty over the course of their nation. However, that nation remains, for many, an occupying nation; the birthrights claimed in central parks around the country a right whose basis lies in the the historic denial of another’s. 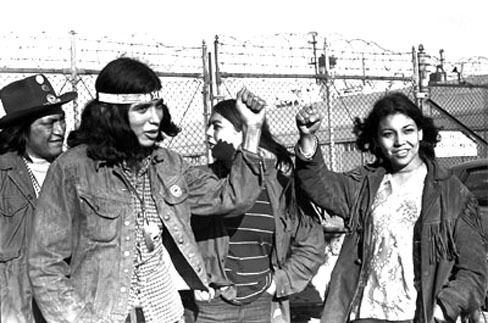 On November 20th, 1969 over seventy people organized by the San Francisco-based Indians of All Tribes set out to occupy Alcatraz Island. Only fourteen made it through the Coast Guard cordon that night, but many more would follow. Five years earlier a group had occupied the island after the closure of the penitentiary, citing the 1868 Treat of Laramie which promised to return all federal land taken in treaty and falling into disuse to Native Americans. The 1969 occupation would last over eighteen months, until June of 1971, and inspire a generation of Native activists. In the months following dozens of federal sites were occupied, leading to the most dramatic occupation of all: Wounded Knee in 1973. Then, as now, Native peoples suffered the worst unemployment, highest poverty rates and the most suicides of any population. Eighty years after the massacre at Wounded Knee and Native peoples we all but invisible, nothing more than a crude Hollywood caricature in the public mind. Those who occupied Alcatraz organized with their own voice and under their own name, seeking to reclaim their past and place a claim on their future. Those claims remain unresolved; the plight of Native Americans hardly improved in the intervening years. The rage in the proclamation below, full of spitting irony and mournful remembrance, can still be felt all these forty-two years later. Justice deferred is justice denied. We will purchase said Alcatraz Island for twenty-four dollars ($24) in glass beads and red cloth, a precedent set by the white man’s purchase of a similar island about 300 years ago. We know that $24 in trade goods for these 16 acres is more than was paid when Manhattan Island was sold, but we know that land values have risen over the years. Our offer of $1.24 per acre is greater than the 47 cents per acre the white men are now paying the California Indians for their land. We will give to the inhabitants of this island a portion of that land for their own, to be held in trust by the American Indian Government — for as long as the sun shall rise and the rivers go down to the sea — to be administered by the Bureau of Caucasian Affairs. We will further guide the inhabitants in the proper way of living. We will offer them our religion, our education, our life-ways, in order to help them achieve our level of civilization and thus raise them and all their white brothers up from their savage and unhappy state. We offer this treaty in good faith and wish to be fair and honorable in our dealings with all white men. There is no industry so unemployment is great.